Tommy, our chalet host in Mazot Couchevel was absolutely fabulous. Nothing was too much trouble, he was polite and friendly at all times and his cooking was superb! On the bend of the road as you descend from Courchevel Moriond (1650) just before the turning for Courchevel Village (1550) you will see it on the right hand side, it takes 5 mins to walk there from our chalets Bisolet, Notus, Premier de Cordee, Passe Montagne & Mazot, and just under 10 mins from the rest of our chalets in Courchevel. 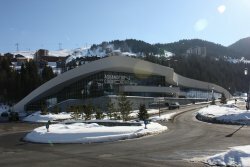 There is a regular bus service every ten minutes from Courchevel Moriond (1650). If you are staying in La Tania the bus service is every hour until 19.10 at 10 past the hour leaving La Tania and 52 minutes past the hour up until 18.52 for the return journey, after that there is a return bus to La Tania at 8.22 and 10.22pm. If you get the bus, when you get off you do not need to cross the road as there is an entrance in the car park that the bus stops at which takes you down a level and crosses beneath the road. What is there to do in there? Espace Aqualudique - this huge area houses a 25m swimming pool for sporty swimming, the pool is at a nice cool temperature perfect for cranking out the lengths, as a swimmer though I was dsappointed to find that there wasn't a training clock on the wall or any kickboards, hand paddles or pull bouys readily available. 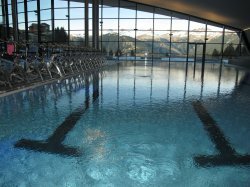 There is also a large leisure pool with water jets which is a much more pleasant temperature for lazing around in the water. Above these two pools are the pentagliss slide and the canyon both great fun although watch out for the shallow trough at the end of pentagliss and the super tight turns of the canyon! 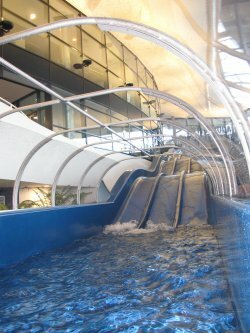 If heights are your thing there is also a deep pool for jumping and diving into from two different heights. Then there is the outdoor pool with more water jets, bubbles, a mini lazy river & bubble beds (like a sun lounger underwater with bubbles!). 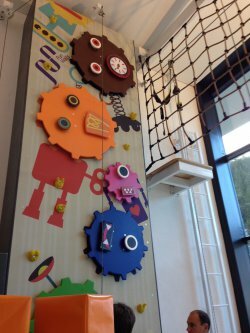 The little ones are not forgotten with a colourful space dedicated just for them. 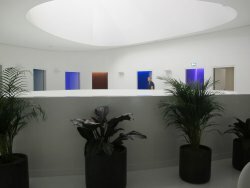 Espace Wellness - this area is for over 18s only, has a 'salty cave' which you descend into via steps, I've not come across anything like it before it is dark down there with 'mood lighting and a screen and projector built in so they can also show animations, this week they had a screening of the northern lights with matching music, the salinity is such that you can just float around soaking up the atmosphere. The main pool in the wellness area is half insde and half outside, there are bubble beds built in both inside and out and more water jets outside. 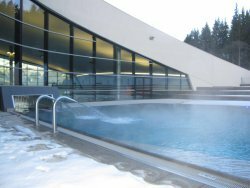 Outside there is a sauna and steam room and a cold plunge pool - if that doesn't wake you up after a hard days skiing not sure what will! Spa & Balneo - Includes treatment rooms, beauty salon and a hairdressers. 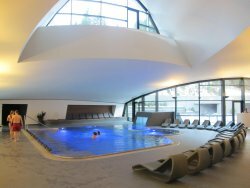 Treat yourself to a morning awakening session for €141 which includes 2 hrs access to the aquawellness alongside a seaweed wrap, a vichy shower and a personalised facial, towel and bathrobe provided. Or treat yourself for a full day for €165 including a seaweed wrap, 25 minute head massage, personalised facial and full day access to aquawellness, towel and bathrobe provided. Individual treatments and massages start from €42. 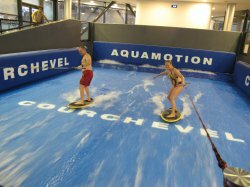 Indoor Surf Wave - The indoor wave has two settings, a flatter one which you can use with a wakeboard rope and handle or a steeper one for simulating surfing. For beginners they start you off on a bodyboard whilst holding the wakeboard rope and gradually progress you through various techniques until you are standing up and trying 360s! There are also different styles of board to try from those pictured here to strap in wakeboards. 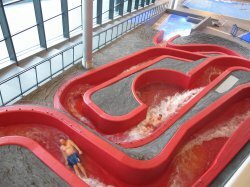 The flow of water on the flat setting has dual control so two people can be surfing at once and don't worry if you fall the landing is very soft - all you'll hurt is your pride! 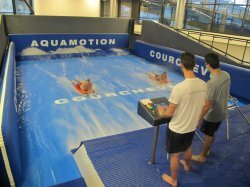 Aquasports - Also available are various water based fitness classes including aquabike, aquafusion, aquaboxing and aquafitness. All good cardiovscular workouts. 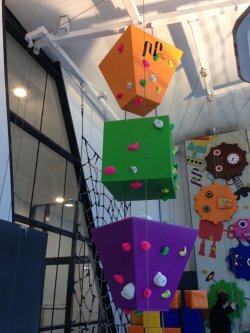 Climbing Wall - There is a great climbing wall with an excellent area for children upstairs, with lots of different colourful routes for them to try. 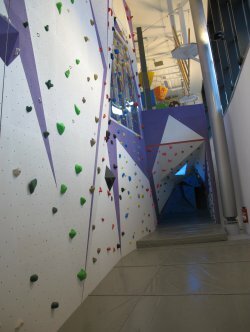 Children must be a minimum weight of 20kg to use the climbing, downstairs their is a bouldering cave and a large wall with lots of different route options available. Cafe Nikki - If all the exercise has made you build up an appetite there is also a restaurant on site called Cafe Nikki you find details of their menu and prices on their website here. Do I have to wear speedos? Not unless you want to, unlike a lot of French swimming pools, swim shorts are accepted and it is not compulsory to wear a swim hat either! Do I need a euro coin for the lockers? 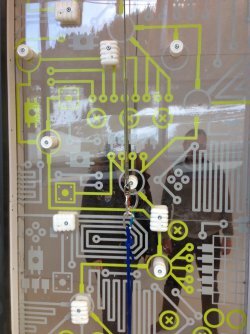 No, the lockers are automatic and work from an electronic keypad, simply close the locker door, enter your own personal 4 digit pass code followed by the green tick and the locker number will flash up to confirm it is locked. When you return to get your belongings out, simply enter the locker number followed by the green tick and then your pass code followed by the green tick and the locker automatically opens. So no need to carry a locker key while you swim.